Access to "Site administration | Users | Privacy and policies | Privacy settings". Change "Digital age of consent verification" to "Yes". Access to "Site administration | Plugins | Authentication | Manage authentication". Enable users registration selecting "Email-based self-registration" from the "Self registration" list. Access to the login page. Click over the "Create new account" button. Enter "15" as your age and select "Czechia" as your country. CHECK that "You are considered to be a digital minor". Setup Login as admin. Access to "Site administration | Users | Privacy and policies | Privacy settings". Change "Digital age of consent verification" to "Yes". Access to "Site administration | Plugins | Authentication | Manage authentication". Enable users registration selecting "Email-based self-registration" from the "Self registration" list. Testing scenario Access to the login page. Click over the "Create new account" button. Enter "15" as your age and select "Czechia" as your country. Click over "Proceed" button. CHECK that "You are considered to be a digital minor". 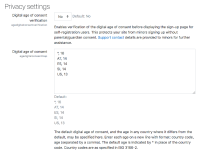 As discussed in the French forums here https://moodle.org/mod/forum/discuss.php?d=367653#p1482823 the digital age of consent in France was changed to 15 in February. Can this now be changed in Site admin defaults?